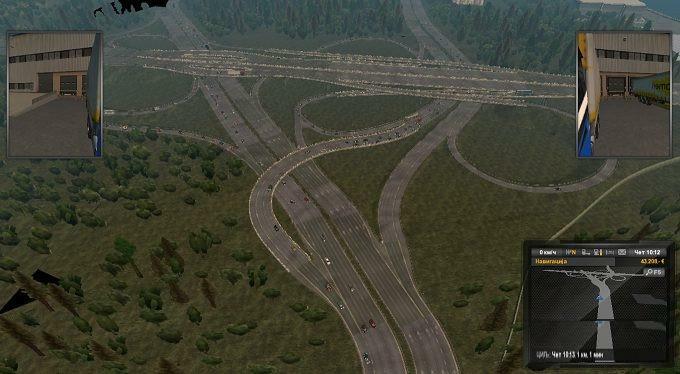 I am rebuilding all standard SCS’ interchanges on Rusmap and modifying highways to real number of lanes. Then I will rebuild all wrong custom interchanges, then correct custom interchanges with wrong number of lanes. Up to now, St. Peterburg ring road is finished. I have problems with assets for realistic signs, so I hope that I will make them later. I removed all 5-lane sections because of AI disappering in right lane and I will return them after SCS solve it. My next direction is Moscow and I will move there with rebuilding all wrong road profiles. Russian goverment built new highway M11 “around” Vyshny Volochyok, so I will try to build them. Enjoy in new St. Peterburg ring road. In file is connection with Promods. From the Vyborg direction to St. Peter on the ring road 1 a shallow bridge.